It began like any other annual offsite meeting. Three hundred of us from our division - “the top management” we called ourselves - gathered to experience lush accommodations, good food and wine, and lots of presentations. The mood, as was typical for these conferences, was a strange cocktail of cynicism and feigned enthusiasm. Then they announced the guest speaker: Ben Zander, conductor of The Boston Philharmonic Orchestra and author of The Art of Possibility. I had just finished the book and it helped me see that the lenses I used to view the world could change everything. (It’s still one of my favorite books of all time.) I wondered what he would say. He played the piano as he told us stories, connecting his experiences as a conductor with leadership lessons in a beautiful way. But the conductor doesn't make a sound. He depends, for his power, on his ability to make other people powerful. And that changed everything for me. It was totally life-changing. People in my orchestra said,"Ben, what happened?" That's what happened. I realized my job was to awaken possibility in other people. And of course, I wanted to know whether I was doing that. How do you find out? You look at their eyes. If their eyes are shining, you know you're doing it. The room was quiet. You could almost feel each of us “top managers” reflecting on whether people in our organizations had shining eyes, and whether we were the kind of leaders who could make that happen. Then, as a means of having us experience something we wouldn’t think possible, he said he was going to have all 300 of us sing “Ode to Joy” in German. Nervous laughter rippled throughout the room as he handed out the lyrics, written phonetically so we could all pronounce them. We shot embarrassed glances at each other like school children trying to avoid the teacher’s gaze. He began conducting us, and a few people mumbled the first words. He immediately stopped us and had us try again, and again, exhorting each of us to reach deeper. Soon, infected by his energy and enthusiasm, we gradually shed our egos and fears and self-imposed limits. We let go - and we sang. We were…doing it! We looked at each other with amazement. We drew confidence from each other and sang louder. Whether or not we knew German, whether or not we were good singers, we were SINGING! At that moment an energy passed through us, a resonance of some kind. We were, perhaps for the first time as a management team, literally “in synch” and “on the same wavelength.” The cynicism melted away and the enthusiasm became genuine. We had tapped into the art of possibility - a sense of capability and wonder and joy. It was beautiful. Throughout the rest of our conference, we talked about that moment. Then the meeting ended. We went back to our offices and our habits, and the feelings of common purpose and possibility faded. I was disappointed, but that image stayed with me, as did something Ben Zander said at the end of his talk. “Now, we're all about to end this magical, on-the-mountain week, we're going back into the world. And I say, it's appropriate for us to ask the question, who are we being as we go back out into the world? And you know, I have a definition of success. For me, it's very simple. It's not about wealth and fame and power. It's about how many shining eyes I have around me." Who are you being? How many shining eyes are around you? It’s taken me a decade to understand that you don’t change your answers to these questions in one magical moment, but with practice over months and years and for the rest of your life. .
That time we all sang “Ode to Joy” in German? It was more than a a nice way to inspire an audience. It was a glimpse of the way things could be. He was a medieval scholar, trying to decipher traces of a poem from the Middle Ages. He was looking at the only remaining manuscript, and it was so badly damaged that he was using an ultraviolet lamp to detect the writing. But the document was too burned and faded. Other scholars had already given up. What he did next is helping to shape our understanding of history. It’s also an example of how small actions you take can expand your knowledge of what’s possible. “And so I did what many people do. I went online, and there I learned about how multispectral imaging had been used to recover two lost treatises of the famed Greek mathematician Archimedes from a 13th-century palimpsest. A palimpsest is a manuscript which has been erased and overwritten. The simple set of steps Heyworth took - searching for people who could help him, deciding to reach out, crafting a compelling letter that earned a response - sent out ripples that changed his career. That same lab then went on to “read even the darkest corners of the Dead Sea Scrolls” and make transcriptions from the Codex Vercellensis, a translation of the Christian Gospels from early in the 4th century. Then he founded the Lazarus Project, a not-for-profit initiative to bring the technology to individual researchers and smaller institutions. That brought him into contact with researchers and precious documents around the world, like the team working on a map from 1491 used by Columbus that was no longer legible. Applying it to you individually, an interviewer described the adjacent possible as “the perimeter of your potential” and that you expand the range of your possible next moves by actively bringing yourself into contact with other people and ideas. What about you and what you’re trying to accomplish? Are you actively looking for people who could help you and trying to build relationships with them? It’s what people in Working Out Loud circlesaround the world are doing. Learning to take small steps that can gain them access to more possibilities. You can shape the perimeter of your potential. How would you complete that sentence? This year I will... If you’ve thought about it in previous years, what actually happened? One way to make a difference this year is to form a Working Out Loud circle. I’m getting more and more mail from people about how their circle empowered them, liberated them. Just this week, a woman told me her circle "had an enormous impact on my life." Yet it’s such a simple process. You write down a goal, share it with a small trusted group, and take a few steps over 12 weeks to build relationships with people who can help you. Deciding to form a circle might just be the best New Year’s resolution you ever made. What’s holding you back that you might be able to change? “They say luck is when opportunity meets readiness. The value of working out loud is it fosters both requirements for luck. I’m still surprised by how true this is and how rich the possibilities can be. Here’s an example that happened to me last week. The story started in July. 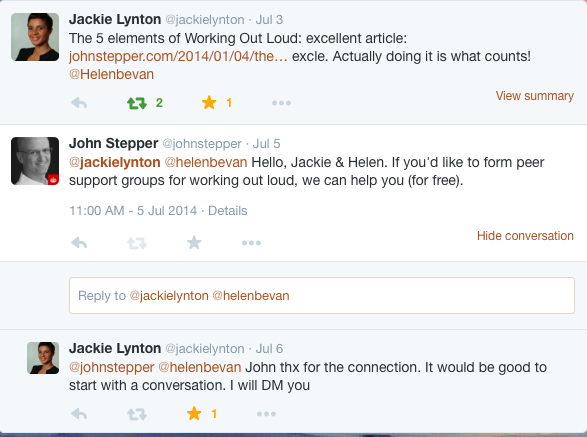 I noticed that someone named Jackie Lynton tweeted about "The 5 elements of working out loud", a post I had written six months earlier. I looked at her Twitter profile and that of the other person she mentioned, Helen Bevan. They were heading up a Transformation Office in the NHS, the national health service in the UK. That was interesting. So I followed them, read some of their interactions on Twitter, and offered to help them. That led to a phone call. What happened next reminded me of a post I wrote called “Deepening relationships through contributions.” It was about how contributions over time can lead to more meaningful interactions and opportunities. In early August, I had a call with Jackie and a few people on her team. That led to me sending them a draft of the book, and to Jackie talking about working out loud circles to other people. That led to a connection with Helen, who has her own firm, and others related to the NHS. I sent Helen a draft of the book too and she formed her own working out loud circle. She was so helpful and generous that when we finally spoke on the phone it was like talking to a good (and extremely smart) friend. I met Jackie and Helen in person in New York City and after getting to know each other better, we decided to collaborate on a half-day workshop. Carol, who found me via others at the NHS, mentioned my work in their new online hub called The Edge. Carol generously offered to review the book and promote it as part of their book club. Helen wrote this excellent post on working out loud and "rethinking networking." Jon, a member of Helen’s working out loud circle, created this wonderful work of art. Maybe all that happened is that I met some smart, interesting people. Or maybe those budding relationships will help me learn how my work might help others in a different industry and a different country. Or maybe I’ll go on to work with one of the most important healthcare institutions in the world. The point is that my set of maybes got a lot bigger. The path to more possibilities is paved with contributions and connections.